It is becoming more of a common practice for veterinarians to recommend a glucosamine supplement for dogs. 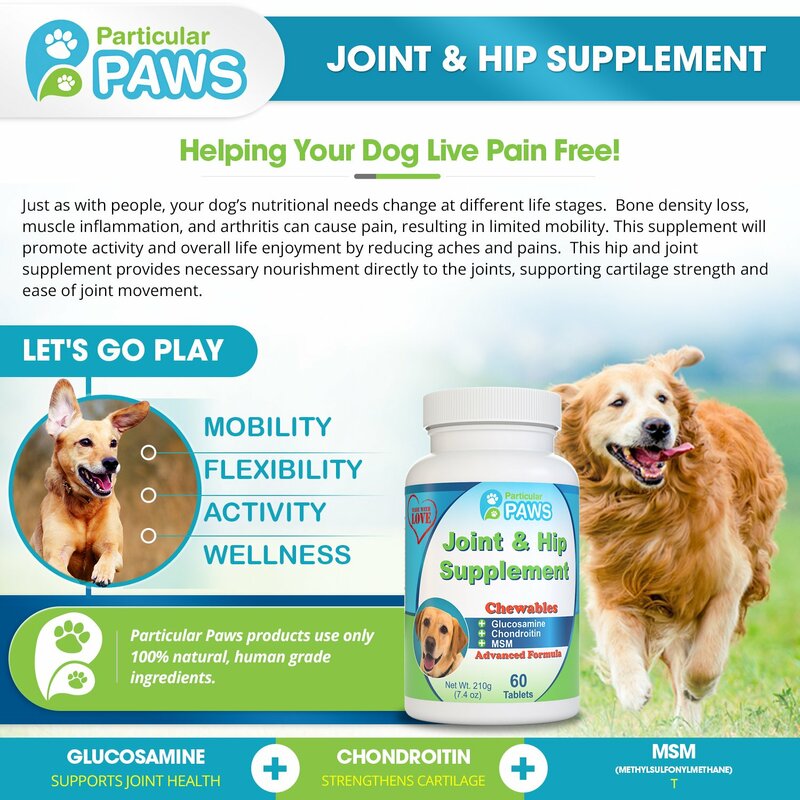 Today, glucosamine is quickly becoming a vital supplement for aging and arthritic dogs or for those canines that suffer from other joint issues. Reducing pain because of its anti-inflammatory properties. Dogs rarely experience any side effects. Naturally restores joint health, leading to an increase in your dog's mobility. Glucosamine can help your dog improve joint health. May reduce or eliminate the need for pain meds and the possible side effects they bring. Now that we know all about how glucosamine works, let's explore our top 5 picks for the best dog glucosamine supplements in 2017. Today, glucosamine is quickly becoming a vital supplement for canines that suffer from other joint issues. 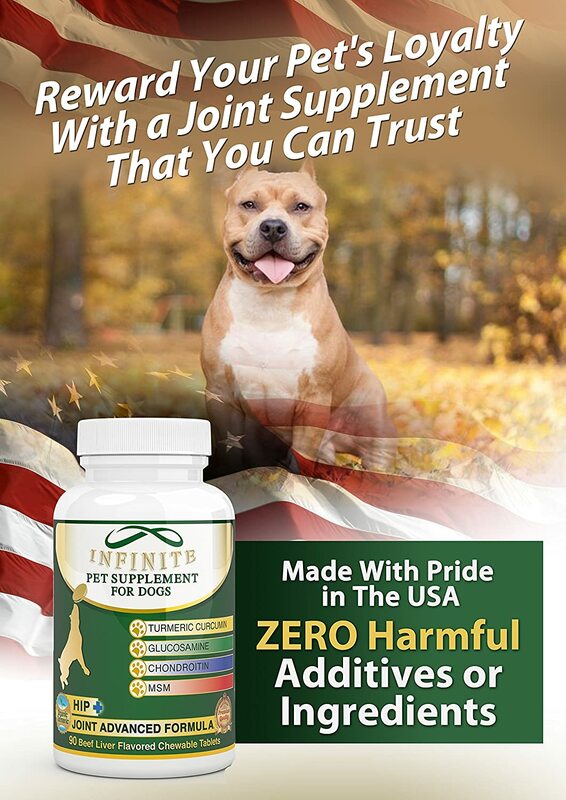 With all the ingredients added to support and repair your dog's joint health, Infinite Pet Supplements is one of the best glucosamine supplements on the market today. It is veterinarian approved because it was formulated by Dr. Ian Stern. Plus, this is one of the only glucosamine products that includes the added benefits of organic turmeric. In addition, this product is produced in a GMP factory and uses no harmful additives, preservatives or artificial colors or flavors. One concern may be the price point on this item may be considered by some as high. With a taste that canines are begging for, Charlie & Smitty Pet Supplies glucosamine supplement is getting rave reviews. This product contains the healing properties of the main active ingredients including MSM, Glucosamine, and Chondroitin. Plus, it goes a step further with the added benefits of vitamin C & E, and Yucca & Organic Turmeric. This supplement is manufactured in the USA and comes with a 100% backed guarantee. One concern for some pet parents with larger dogs is you will need to feed them more than one chew per day. Made in the USA under the strictest guidelines, Doggy Dailies is a glucosamine supplement you can trust. This safe and effective formula contains 6 powerful main ingredients to help your dog with mobility, pain, and inflammation of the joints. Plus, it also contains other healthy ingredients like cooked chicken (powder), carrots, spinach, beets and flaxseed flour. One concern may be the price point on this brand is a tad high. Don't mask your dog's pain with NSAIDs or other pain relieving meds when you can treat the problem with Particular Paws glucosamine supplement. This product reduces inflammation, pain, and stiffness of your dog's joints giving him his life back. Particular Paws has also gone a step further in the treatment of your dog's health by adding in antioxidants, rosemary and Omega 3 and 6 fatty acids. One concern for pet parents is that this product uses shellfish. 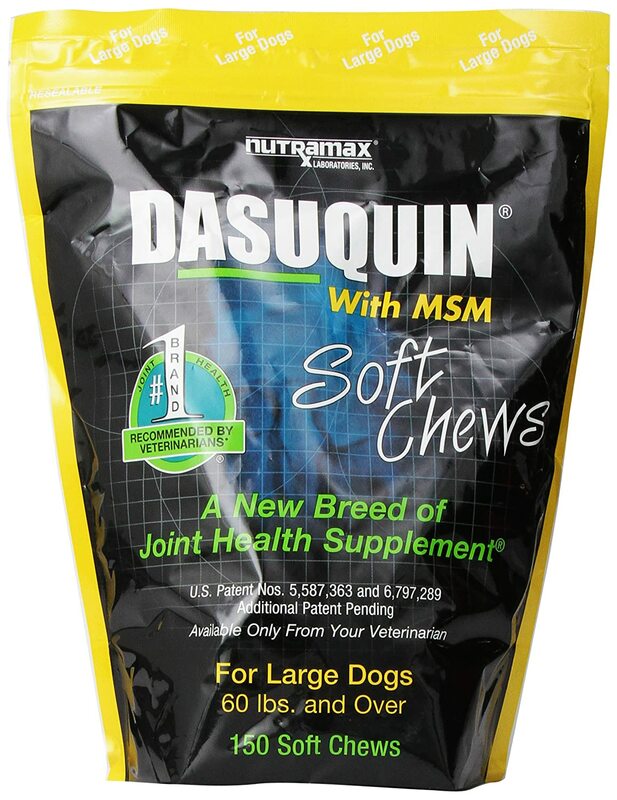 Formulated by veterinarians, Nutramax Dasuquin glucosamine supplement is complete joint care for your canine companion. 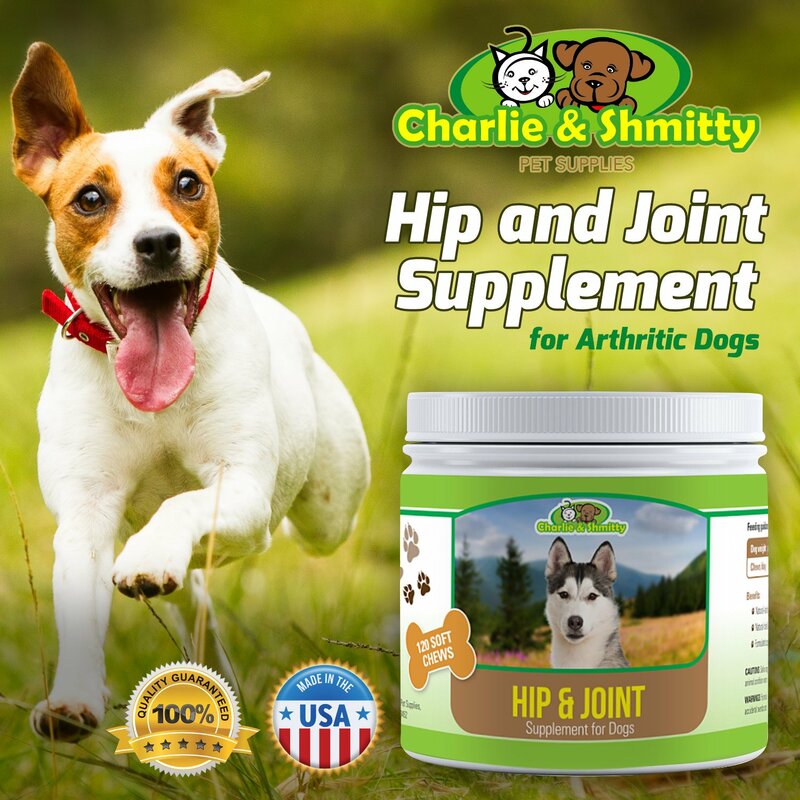 It contains other key components that make it highly effective in the treatment of your dog's stiff joints. This supplement is also easy to administer as it is chewable and is available for small, medium and large dogs. Contains glucosamine hydrochloride, low molecular weight chondroitin sulfate, avocado/soybean unsaponifiable (ASU) and methylsulfonylmethane (MSM). One concern for some pet parents may be that this product does contain soybean. How Does Glucosamine Work in Dogs? Cartilage performs a very important task. It is the moist spongy material that forms a cushion between your dog's joints. Healthy cartilage prevents the bones from rubbing together. However, inside your dog's cartilage, there are cells. These cells are in constant turn-over. When the cartilage becomes damaged, the joints become inflamed and release more enzymes that further damage the bones. When a glucosamine supplement is added to your dog's daily diet it is said to help alleviate the symptoms of joint degeneration. It also helps to increase the repairing of that spongy material to better cushion the joints. How Do I Give My Dogs Glucosamine? Most glucosamine supplements can be found in a pill, tablet, powder or a liquid that is flavored to be palatable to your dog. Never give your dog a glucosamine supplement made for humans, but rather those specifically for canines. 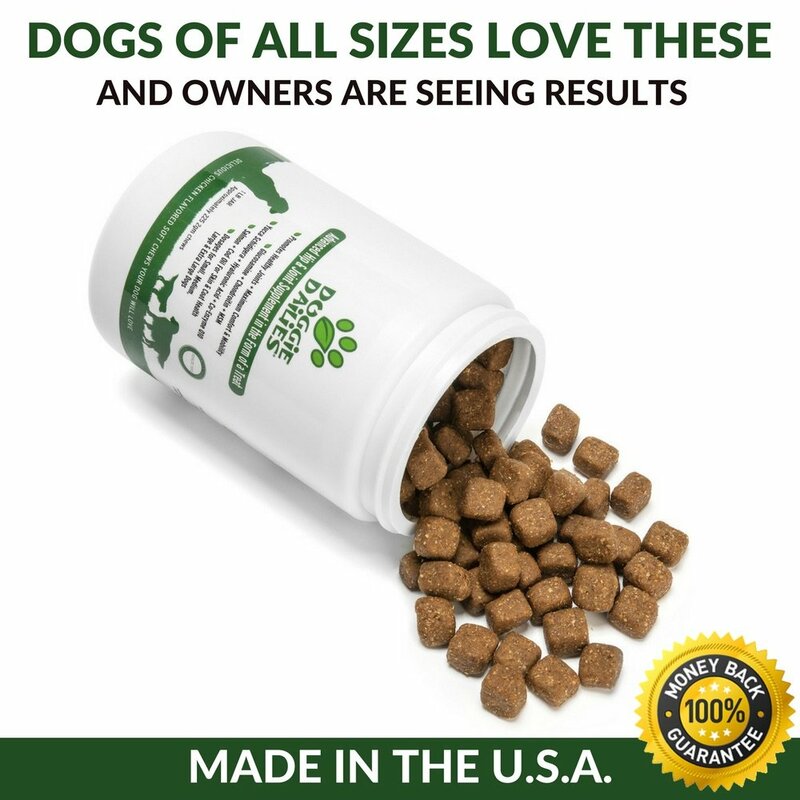 Read the dosage recommendations on the product label or, if you are unsure, ask your veterinarian how much glucosamine your dog should be taking. Are There Any Side Effects of Clucosamine Supplements? Although side effects associated with glucosamine are few, you still need to be careful with the use of glucosamine for your dog. Also note that since glucosamine is a sugar-based substance, some veterinarians may be reluctant to give it to canines with diabetes. Whether you have an aging dog or a canine that is highly active, the benefits of a glucosamine supplement is a good way to support your dog's joint health. These glucosamine supplements are highly effective in the treatment and repair of your dog's damaged cartilage. However, if you are unsure if you should use a glucosamine supplement with your dog, be sure to check with a veterinarian for further advice.